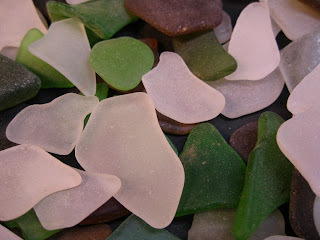 I collect sea glass. I've been collecting it for about 16 years. 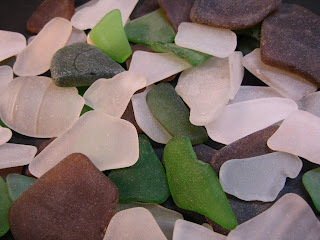 I don't have the opportunity to visit many beaches for seaglass during the year, so my window of searching is a two week period every summer at our cottage on Prince Edward Island. 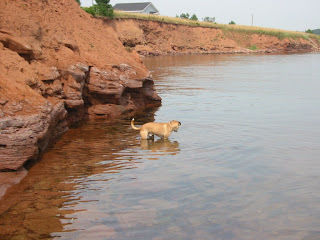 I love to scour the beaches on our little point. My yield each summer is never a windfall, there have been years of collecting that have been better than others, but typically it is a scant handful that I come home with. Our area is not the best for large quantities, and some days I only find a piece or two. To me, that makes it even more special. This photo is of my searching companion Perry, who passed away 11/07, he stayed by my side and searched along with me. I miss him so much! I may just be a seaglassaholic. I have only made one jewelry item (a bezeled pendant) from sea glass (which my mother owns), and I actually found that one small piece very hard to part with. I keep larger pieces that I have found in a restaurant cheese shaker on my kitchen table. Smaller pieces I keep with my gems. Sea glass to me is more than just a gem of the sea, it is solitude, relaxation, awareness, peace and harmony, all rolled into one. It takes some serious 'alone time' to find any on our small inlet, which I relish in. It is my zen, my yoga, my therapy, and I look forward to my search every summer.